Il mio ultimo progetto: realizzare QR code ricamati a punto croce (nella foto il primo della serie). is a popular form of counted-thread embroidery in which X-shaped stitches in a tiled, raster-like pattern are used to form a picture. Cross-stitch is often executed on easily countable evenweave fabric called aida cloth. The stitcher counts the threads in each direction so that the stitches are of uniform size and appearance. This form of cross-stitch is also called counted cross-stitch […] Cross-stitch is one of the oldest forms of embroidery and can be found all over the world. (abbreviated from Quick Response code) is a type of matrix barcode (or two-dimensional code) first designed for the automotive industry. More recently, the system has become popular outside of the industry due to its fast readability and comparatively[clarification needed] large storage capacity. The code consists of black modules arranged in a square pattern on a white background. The information encoded can be made up of four standardized kinds (“modes”) of data (numeric, alphanumeric, byte/binary, Kanji), or by supported extensions virtually any kind of data. QRoss stitch is a project that blends tradition and innovation. 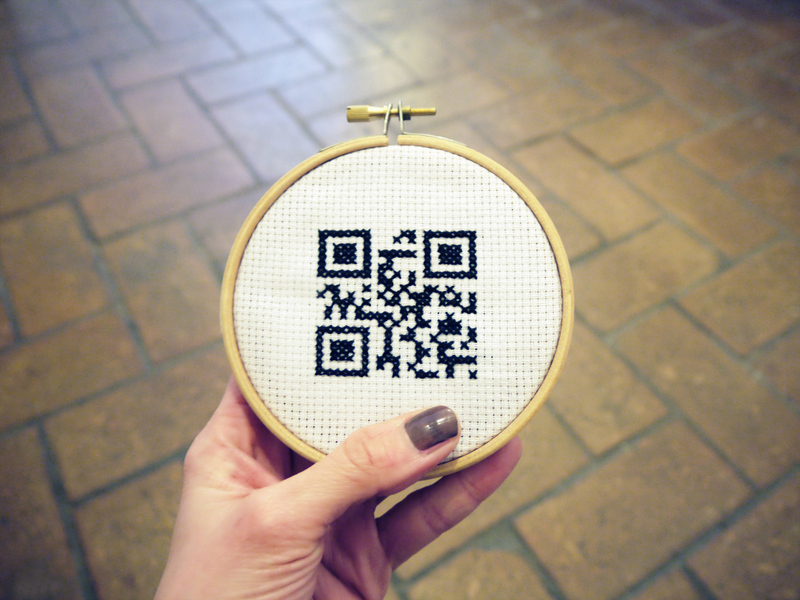 Hiding internet-language-related messages, these embroidered QR codes – that any smartphone with a qr code application can decode – combine the embroidery tradition with a modern technology. The embroideries are handmade, stitch by stitch, weaving the code of a matrix whose messages we are immersed in, even when we don’t realize it. QRoss titch è un progetto che fonde tradizione ed innovazione. Celando messaggi legati al linguaggio di internet, i codici QR, ricamati ma comunque codificabili con qualsiasi smartphone dotato di una applicazione per qrcode, sposano la tradizione dell’antico ricamo ai registri della tecnologia contemporanea. Il ricamo è eseguito a mano, punto per punto, come il codice di una rete matrix nei cui messaggi siamo immersi senza rendercene conto. The exhibition consists of a number from 13 to 23, different sizes, of embroided QR codes coming along with photos of the creating act. L’installazione consiste in un numero variabile da 13 a 23 codici QR ricamati di misure differenti, affiancati a scatti del momento della creazione dei ricami.